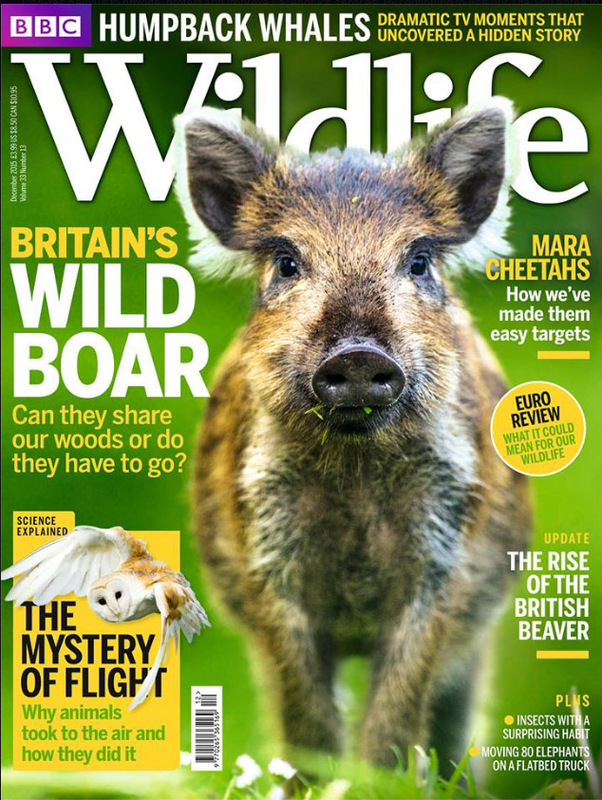 A really good article on the forest's wild boar has appeared in BBC Wildlife magazine this month. Ben Hoare, the author, interviewed Friends of the Boar at length in November and we are delighted to see quite a lot of our information got through to print. It was refreshing to see some positive boar facts in the media for a change, such as the University of Worcester's recent survey revealing that a "huge majority of respondents feel boar are beneficial." 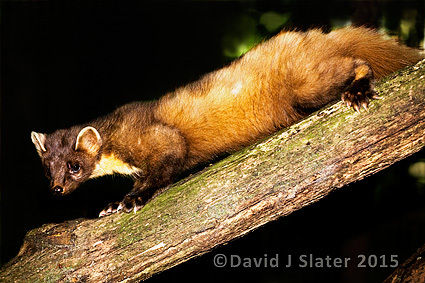 Sadly we see more deceit from Ian Harvey at the Forestry Commission, and also from Robin Gill at Forestry research. They insinuate the boar can breed all year round because of the forest's "plentiful food and mild climate." This is wrong because because boar do not breed year round (unless mismanaged), and the food supply dwindles in the winter - hence the need for them to root the roadsides. Another untruth of Ian Harvey is that wild boar have 6-10 piglets, "since they are hybrids between wild boar and farmed pigs". Total nonsense, and he knows it. This they know to be untrue and are purposefully deceiving the public. No wild boar in the Forest of dean has been seen to have more than 7 piglets in 11 years. DNA tests have shown that all boar, all across Europe and Asia have "farmed boar" genes in them, but these genes are recessive. The boar are not feral anymore and act and look like true wild boar despite the tiny element of domestic genes (that all the boar across Europe also have). What Ian Harvey tries to base this pseudo-fact on is a post-mortem finding in a sow a few years back that had 12+ corpus luteum or "yellow bodies". This is the structure that bore the egg in the ovary and was left empty after fertilisation. These can equate to embryos. But again, Harvey quotes from domestic pigs for they have a greater correlation between corpus luteum and piglet number. But 12+ corpus luteum in wild boar does not mean that 12 piglets were to be born The sow produced 12+ eggs, of which 50% were likely to become embryos. We also note a councillor claims the boar in Ruardean primary School in 2008 HAD to be shot, when actually it did not. We have covered this previously, with a photo of said boar happily munching on windfall apples in a corner of the school field doing no harm to anyone. The children, as the councillor rightly states, were sad and shocked to see an innocent animal shot before their very eyes! So as per usual, people with propaganda to spread and an ill-will towards wild animals get a say in opinion pieces, but we hope you will do your own study and find the truth. We are glad, however, to see conclusive reporting that wild boar are actually good for bluebells. We are also glad to read of 4 ways we can learn to live with the boar (better fencing, meat-fund, garden-angels/turf teams, contraception). Actually, contraception may work but not the way the Forestry Commission wish using the dangerous non-species specific contraception administered via a feeding device. We have been approached by a company who are willing to do this on the wild boar. We hope to bring further news on this in the near future. Please get a copy and read the rest yourself. It is definitely worth a read. BBC Countryfile aired a programme on 13th December 2015 that covered some of the issues of wild boar in the Forest of Dean. Friends of the Boar were consulted on the topic and David Slater agreed to try and help find some boar for them to film and to appear on the programme too. 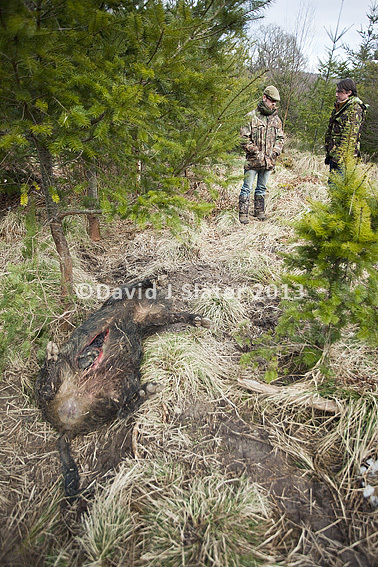 Tom and David Slater find teeth gashes of wild boar in conifer trees. We had 3 days to find some boar, and that proved to be quite tough. Surveying the entire Forest it had become very clear that boar numbers were now terrifically low, perhaps less than 70 left. Boar rootings were massively reduced compared to more recent years, as were all other signs. It reminded us of 2008-9 in terms of rootings, when the population was put at around 60-90 animals. 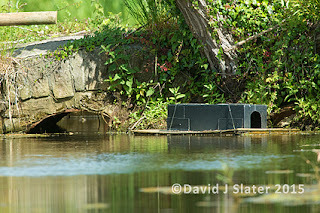 Dave had discovered an area that held about 3 boar, so we concentrated on that area when the pre-filming team arrived. Signs were good and wallows had been used, and the crew waited from 3pm until dark to hopefully see them. It wasn't to be. 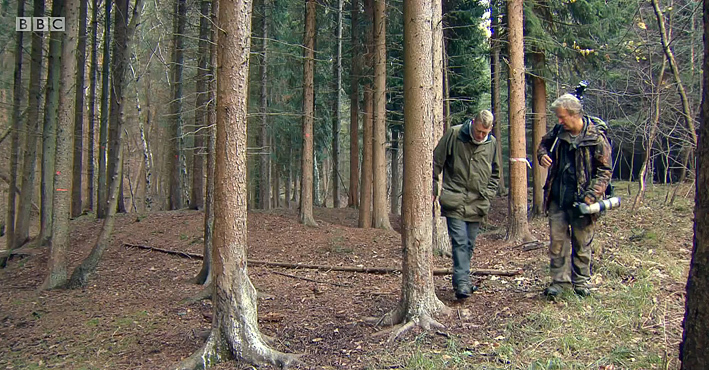 David leads Tom through ideal wild boar habitat. 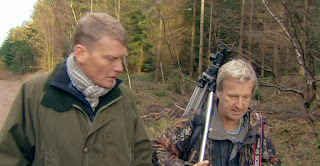 But we believed it was just bad luck, and on the day of filming when Tom Heap arrived, Dave took them back to the area. New signs were there, but again they left without a look at a boar. Finding boar can never be certain and the crew left saddened, as they were all looking really forward to catching sight of one - for personal reasons as much as professional. 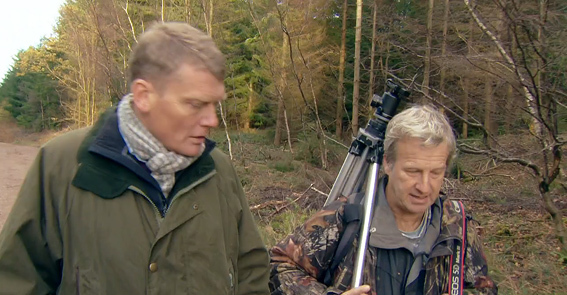 Tom and David discuss the wild boar during filming. We all had a nice day anyway and the chat about boar to the crew was stimulating and they were all interested as well as sympathetic to our side of the story. 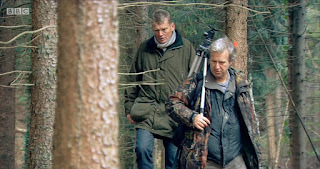 Dave talked to them off camera about the population figures being propagandised by the Forestry Commission as outrageous, biased and scientifically flawed. They agreed that it was very strange that a population of over 1,000 boar meant that 10-12 boar existed per square kilometre, yet after many kilometres walking and searching we saw nothing. They saw nothing at The Rising Sun pub - a site the anti-boar locals claim boar visit every night. They saw none on their drives around the roads, and when locals were asked for any any recent sightings they all said none. 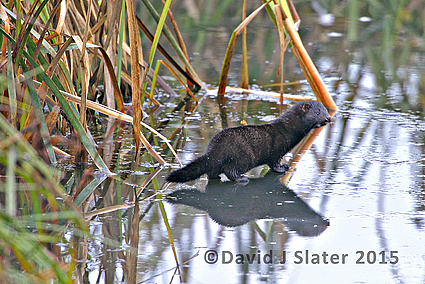 On camera, Dave explained the hunting myth about predators and compensatory rebound effect - how numbers rebound back to normal, and often more, after rapid and unscientific culls. He explained that the 360 boar killed this year were part of the ongoing compensatory process and cannot be a reflection of the total boar population. This wasn't aired. Also, Dave suggested that 75% of the cull were humbug coated piglets. The Forestry Commission always attempt to dupe the public with cull numbers, preferring to give an impression that all boar killed are large adults as well as living all at the same time. No. Piglets are targeted ever more due to their ease of selling the meat to BBQs (the FC sells piglets direct to the public). Dave predicted a glut of piglets early in the new year to the crew because numbers were now so low that increased shelter and nutrition left available for survivors meant that piglet mortality would be drastically reduced. This wasn't a topic they wished to film. 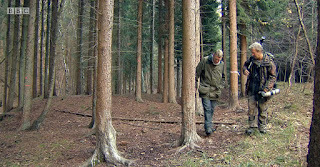 Dave explained how the Forest of Dean couldn't support more than 400 boar, making the Forestry Commission estimate a joke. He compared density of boar to Europe, which at similar latitude and tree cover holds constant at 3-4 boar per square kilometre (in ideal habitat). This was not aired. Dave explained his strategy that overcomes mismanagement and lack of knowledge on numbers. Allow a core area to be a sanctuary for the wild boar, culling only the boar that leave the Forest each year using high chairs and marksmen on the Forest periphery. Excess boar surviving the births in Spring increase the density of boar. By Autumn this excess will leave due to overcrowding. These boar are the ones surplus to The Forest, and if left alone will damage farmland as they spread outwards from the core sanctuary. This was partly aired. One other thaing that wasn't aired and purposefully ignored was the terrific amount of forest damage by tree felling vehicles. The Forest looks quite ugly right now. We are seeing the worst ground and tree damage by the Forestry Commission for years, and that is saying something! What was aired, in fact, was a piece that had already been determined to agree with impossibly high numbers of boar, of the many signs we saw (we didn't see much! ), of the 1-2 dogs per year that had been hurt because the dogs were harassing the boar, and of the local hospital repairing its dilapidated fencing. This was The Dilke hospital, whose grounds had been rooted about a month before. Boar had found the fence of the Dilke to be broken by a fallen tree - something the BBC crew had seen for themselves but didn't film it. The boar helped themselves in of course, lured by bird feeders and fresh grass. The Dilke, after 10 years of knowing about boar habits, didn't seem to care the fence had been broken. Lesson learnt we hope. About to set up a trail camera - not enough wild boar left to find on demand these days! As night encroached on the day of filming (you can see this in the final footage and the photo above), we decided to use a trail camera to catch a boar. Dave took the camera back to the original site and was delighted to find that the boar prints he had shown the crew were that of a large and solitary male boar. In fact, the footage was taken at about 3pm - the time we had first assumed the crew would have the best chance of a sighting! All in all a good day but we are a little sad that a lot of truth about population and mismanagement was ignored from the show. But they are the BBC after all (with a parliament to keep happy over license fees), and The Forestry Commission is a beloved quango of government. 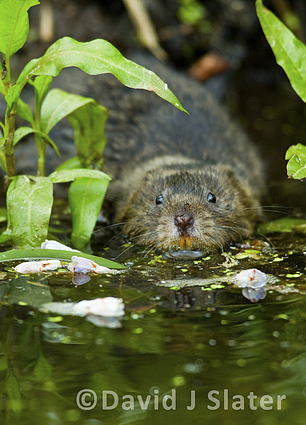 Strange things occur in the Forest of Dean, and this week is no exception. A wild boar head has was discovered - nailed to a tree. Discovered, allegedly, by animal rights personnel. Attached are 3 images for you. Earlier this year I witnessed an organised dog hunt with an FC ranger. This practice has been ongoing for maybe 2 years now. Heads of deer are placed in cages somewhere in the public forest estate. 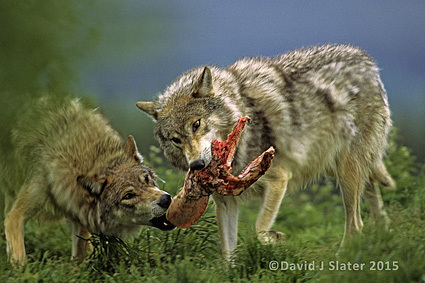 Dogs are then trained to scent the carcass and find it, somewhat like drag hunting for foxhounds. Friends of the Boar have been alerted in the past by members of the public have been alarmed when finding such horrendous sights as a head of an animal in a cage. Friends of the Boar know that the FC have been laying out dead deer for the wild boar at high chairs for many years now too, enticing the boar so they get shot. One such deer was photographed and became an embarassment for Defra and Forestry Research, who blamed it on a researcher who should have known better. 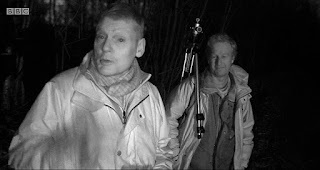 This was when DEFRA were using remote trail cams to study the effectiveness of non-species-specific-contraception delivery devices spaced around the forest in about 2009. Meat left like this can be sources of disease which can be eaten by boar and spread to humans who eat the meat. The images I send you are from 2013. 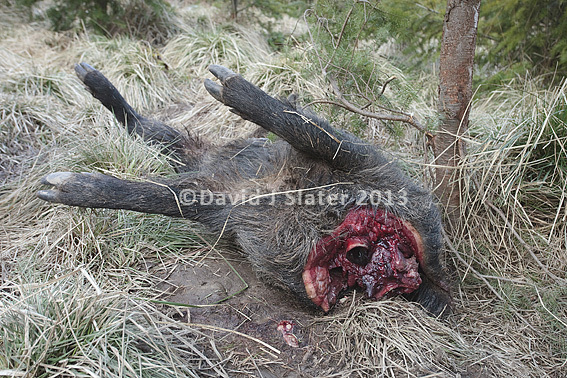 I have been told by a reputable source close to the FC that this was done by Forestry Commission rangers, who regularly take heads of boar to either use for dog hunts, or make a skull from by boiling off the flesh, and/or sell to trophy dealers. The men in the images were a film crew for BBC Springwatch who I was showing around. The gash to the stomach was to prevent gas bloating and to allow quick access to the carcass by scavangers such as the boar or foxes. The head of a wild boar has been found nailed to a tree in the Forest of Dean. It has been found nailed to a tree near Blakeney Hill Reservoir. The head was put on a popular family trail, where people walk dogs, take their children for walks in the woods. It has been reported to police and the Forestry Commission. 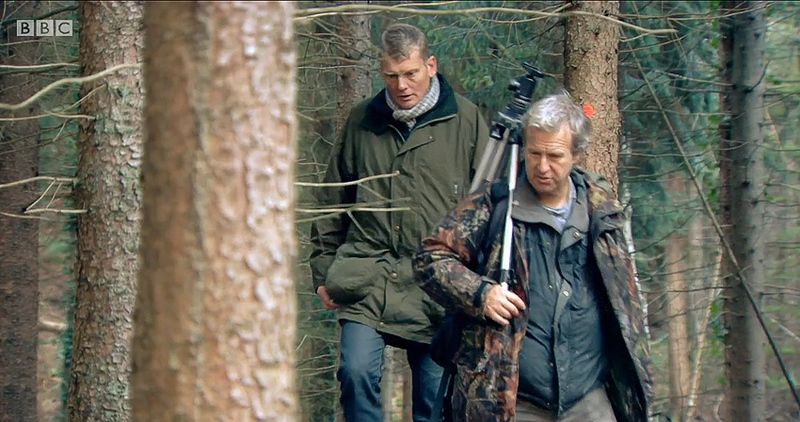 In response the Forest of Dean Wild Boar Cull Hunt Saboteurs have installed trail cameras at popular spots. For 4 years, this has been an all too common result of the Forest of Deam local press refusing to criticise the government stooges at Bank House in Coleford. They link the event to animal rights groups instead, without further elaboration. BBC Springwatch witness the decapitated boar as friends of the Boar make enquries. 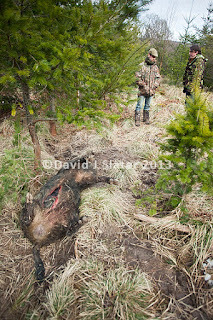 Wildlife Manager Ian Harvey do to the boar. Forestry Commission rangers have been known to use pet dogs to scent down wild boar. Dogs are used across Europe as weapons against the boar, as our last post highlighted. The Forestry Commission help hunting dog enthusiasts to hone their scenting skills, originally to hunt down deer, and now we believe to hunt boar. 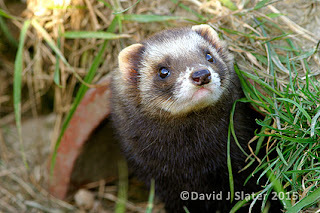 Please register your complaint to your local MP, and if you live in the Forest of Dean send your concerns to Mark Harper MP. We understand very few people will do this, but please be brave and stand out from the crowd, and do what you can to stop the Forestry Commission from continuing this disturbing practice within the Public Forest estate where your children may walk with innocent smiles. Last month, on the 9th August 2015, the newspaper Corriere della Sera reported on a story about a 77 year old man, Salvatore Rinaudo, taking his dogs for a walk. His wife heard the dogs barking at some Wild Boar and then the Wild Boar attacked the dogs. The man tried to defend his dogs but was attacked himself. Somehow, his wife was able to run to the scene to help only to suffer some minor injuries herself, with some reports saying she was in her house when she saw the attack. The injuries he sustained resulted in his tragic death. We have tried to get more information about this story but have failed. British newspapers also seem unable to get more information, repeating only what is told in Corriera della Sera. As usual, The Daily Mail embellish the bit about the wife being at home, suggesting the attack took place on their doorstep (they must live in the woods). The local Sicilian authorities, including the Forestry department, appear to be taking this all in their stride, despite protests from the Mayor of Cefalu, Rosario Lapunzina and the Mayor of Pollina, Magda Cullota. They accuse the Forestry department of not acting earlier to manage the boar, and now appear to be suggesting a criminal manslaughter investigation be opened. Obviously someone wishes the Forestry department to be held accountable and charged with this man's death! Italy has an estimated Wild Boar population of between 600,000 and 1,000,000. It is a cultural icon giving Italians both meat and hunting. It is the same in Germany where Boar are now becoming a problem and have been entering cities like Berlin for many years to escape the hunters and take easy handouts from people who feed them. 1. You are one of those who does not understand that hunting is the cause of the problem and not the solution? I think so. In boars already they are hunted even outside the hunting season ..
2. But so far with hunting they have contributed to the proliferation of wild boars. 4. Finally someone SAYS HOW THINGS ARE. Do not you realize that the hunting world only care that the wild boar and there is always plenty? Who do you think has spread everywhere the boar? ...As long as you stick to the guns, it will always get worse, as has been so far. It's not about being animal rights, it is a matter of ecology, science and common sense. 5. In Italy there are 1Million boars and 7Million dogs. The latter are seen and heard everywhere. Moreover, these pets each year cause many more attacks on people and victims than any other animal. Interestingly, we learn from these commentators that wild boar are now being hunted all year round, with no safe period offered in a "closed season". Furthermore, hunting year round and without any scientific method as to which animals should be "culled", animals such as wild boar (along with humans, foxes, rats, rabbits and many more) will begin reproducing even more, making the initial population increase in the longer term. Friends of the Boar fought hard to get our Forestry Department to realise the sense of this, but it seems that fear and bloodlust can defeat common sense and ecology, and make matters worse by reverting to hunting year round. Commentator #5 makes the pertinent observation about dogs being the number one animal that causes more injuries and deaths of people each year. 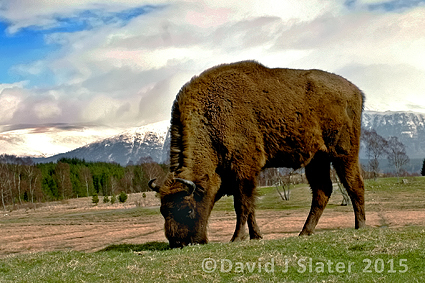 So again, we need a sense of perspective too rather than any knee jerk reaction and call to kill the wild boar. So crazed are some hunters and mayors of Italy, they are now wishing to see the extermination of indigenous Brown Bears too! Bears must die because of the Wild Boar!!! But as a final food for thought on all this, we ask the question of just what was Salvatore Rinaudo doing to get so badly injured? Where his injuries as terrible as we are led to believe even, because sometimes a minor cut which gets infected can kill an elderly man who maybe was suffering from other health issues? Was Salvatore a hunter? He was 77 years old and, given Italian culture and the fact he was living in the woods alongside the boar, was likely to have some persuasions for hunting. It was a couple with puppies and dogs, but evidently not pet dogs but hunting dogs. When wild boar attacked them he reacted to defend the pups. When the owner reacted to defend them, he got hurt too. We must remember that the house of the unfortunate victim was close to a forest that is also the nature reserve and wild boars attack only for defense and that the problems of Sicily and certainly not the wild boars! If he wasn't a hunter, he was the first innocent bystander in history to have been even injured, let alone killed, by a wild boar. Hunters and their dogs commonly abuse and intimidate wild animals such as boar, especially with dogs. Owners of two pet Alsatians happy for them to intimidate Wild Boar in a Forest - could this be Salvatore's home? More pet dog owners laugh at antics of little dog chasing wild boar! These stupid people will very quickly call for the death of all wild boar if their dogs get killed. They will petition the mayor of their town, claiming it is only a matter of time until someone gets killed! Who else should be on trial in court in Sicily for manslaughter - for the killing of an Italian Pensioner whilst taking out his dogs for a walk? Answer: Irresponsible dog owners on these videos and the hunters. That is who. They ARE INDIRECTLY RESPONSIBLE FOR THE DEATH OF SALVATORE RINAUDO. And this is why many people in the Forest of Dean will do everything they can to stop unecessary killing (culling) of the wild boar. We are continuosly kept from the truth about the boar, their importance to the ecosystem, our culture and their true behaviour. The fight to stop you getting injured by a boar because of stupid dog owners and irresponsible hunters. Animal Activists Vow to Stop Planned Wild Boar Cull in Forest of Dean. Elderly couple were attacked by some wild boar while they were at Cefalu, near Palermo. Salvatore Rinaudo, 77, died. His wife Rose, 73, was hospitalized for wounds. The two were at their home in the countryside between the districts Ferla and Mollo, in the hills a few kilometers from the town when he called for help. He was trying to save the dogs, "My husband came out with the dogs for a walk this morning. I saw that he had stopped because the dogs began to bark in a group of wild boars. " This is the story of Rosa Rinaudo, who spoke with investigators to try to reconstruct when successful. Salvatore Rinaudo has tried to put the dogs to safety, but he was attacked by a pack of wild boars and fell. While animals continued to load his wife stepped in to defend it and to drag it into the house, but was in turn attacked. Suffered injuries all over the body, but not in a serious condition (she was given a prognosis of 15 days). "My husband tried to save the dogs," she added, "but the boar jumped on him. I try to recover the body I went outside but as I tried to take him into the house I was attacked too. There are no words to describe what I saw. We are devastated. " For some time the mayors of the municipalities of the Madonie indicate risks due to the increasing number of wild boars in the territory. "Many times it has been reported the danger of wild boars and there's also been called a campaign for controlled killing, but it was never adopted in any measure," says the mayor of Cefalu, Rosario Lapunzina. "We are shocked and deeply saddened by what happened, but also very angry because this is a tragedy waiting to happen." "For over a year we have made a request to the Region because the phenomenon has grown, and we expected that something serious could happen," adds Magda Culotta, mayor of Pollina. "Ours is a cry of alarm because, as we stand in an area of ​​the park, is the region that has to act. We had many meetings with the departments of Agriculture and Land, the park authority, the prefect, but still nothing concrete has been done. Hopefully after this tragedy, things move quickly," concluded the mayor of Pollina.